Several people are reported to have been killed in various parts of the Amhara regional state in Northern Ethiopia, where an ongoing protest by the people is intensifying. The VOA Amharic service quoted a resident in Debarq yesterday that four people were killed when security officers fired live bullets at protesting civilians. Over the last few days several reports on social media indicated a rising death toll following security crackdown against a stay-at-home protests in Bahir Dar and Gonder, the region’s capital and a historic city visited by thousands of tourists respectively. Pictures coming from many cities and towns in the region also show protesting citizens, burning tyres and roadblocks. Reports also indicate that up to 50 civilians were killed in the past one week only. Tensions are on the rise following a statement given to state owned media by Prime Minister Hailemariam Desalegn in which he announced that he has ordered the Ethiopian National Defense Force (ENDF) to intervene to control the situation in the region, home to the second largest ethnic group in the country. In his speech PM Hailemariam blamed Ethiopia’s “outside enemies” for being the instigators to disrupt the country by providing “radicals with sacks full of money.” He further stated that the government will use “its full forces to bring the rule of law” into the region. A day prior to PM Hailemariam’s statement, Sheger FM, a private radio based in Addis Abeba, reported that the regional state has requested a military intervention by the Federal government. Talking to the station, Nigusu Tilahun, the regional government’s Chief spokesperson, conceded that lives were lost in the recent protests but declined to give numbers. As a result of intensifying protests, the regional government requested the intervention of the federal army, Sheger FM quoted the spokesperson. Accordingly reports indicate that the region is now divided into five zones and is placed under a military command. Pictures circulating around social media show heavy artillery moving towards the state capital Bahir Dar, 550 km North of Addis Abeba, and the nearby town of Gondar where the recent wave of #AmharaProtests originated late last month. Internet is shut off in the whole region while locals fear government sanctioned phone call monitoring. The #AmharaProtests began in late July when security forces tried to arrest leaders of the Wolkayit committee, a committee formed by the people of Wokayit to find solutions related to the border and identity questions of the Wolkayit community. In the last few days, tens of thousands of citizens in several cities and towns in Gojam and Gonder areas of the region have come out to the streets to protest the government. In what many see as the ultimate test of the ruling EPRDF, protesters are also showing solidarity with the #OromoProtests which began in Nov. 2015. In the weekend of 6-7 August region wide protests both in Amhara and Oromia regions were met by violent crackdown by security forces. It’s reported that more than 100 civilians were killed in that weekend only, according to Amnesty International. In Bahir Dar alone, more than 30 people were killed when a security guard opened fire at protesters. The government disputes that number. The stay-at-home protests in Bahir and Gonder followed the deadliest weekend, however in the last few days that too turned violent when security forces began breaking into houses in an attempt to force citizens and businesses to stop the stay-at-home protests. Some reports claim that attacks against government institutions and party owned and affiliated businesses were witnessed in some cities and towns. There are also reports that young men and women are being arrested en mass by security forces. An over 250 regime soldiers deserted the army in Sanja, Amhara region following a brief gun battle with local farmers. A source who spoke to ESAT on the phone said some of them have actually surrendered during the fight with the farmers. The soldiers deserted with dozens of artilleries and medium range rifles and have now sided with the locals who are fighting the TPLF forces. The regime in the last two days have sent over 2000 soldiers and Agazi Special Forces to the Amhara region; but their journey came to an abrupt stop at Checheho, Gaint where locals demolished a bridge, halting the movement of the troops further into Gojam and Gondar where over 200 people were killed by the TPLF forces in the last few weeks of uprising. In Metema, a border town with the Sudan, several houses belonging to officials and spies of the regime were set on fire. At least 10 people were killed and 20 others injured as regime forces shot indiscriminately at protesters. In Debark, Gondar, 4 people were killed and 17 injured by TPLF soldiers who went on a revenge attack against protesters who on Monday set on fire a truck loaded with flour and oil heading to Tigray. On Wednesday, following a burial for the deceased, protesters set ablaze the houses of the mayor, the security chief as well as others who took part in beating protesters. In the town of Gondar, 21,000 students of Gondar University left the campus and went home quitting classes for the rest of the semester in protest for the killing of two students by the regime and to show solidarity with the people of Gondar. 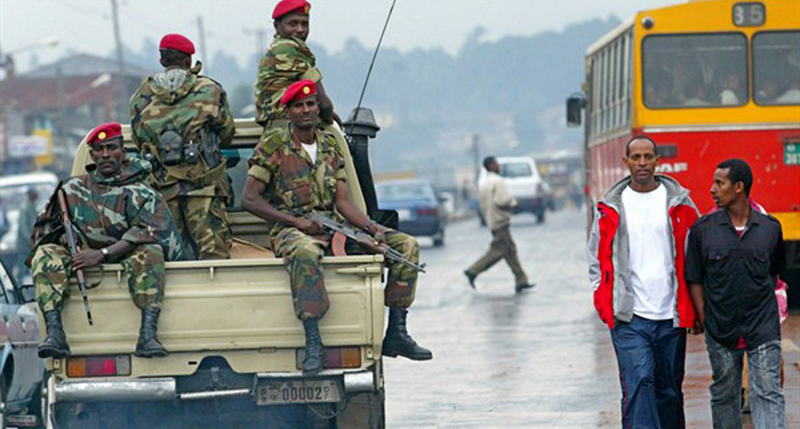 In Amba Giorgis, a town which saw the brutality of TPLF forces this week, a mother searching for her lost child was shot and killed in the street, igniting a gun battle between the militia and police on one side and the local farmers on the other. Eight police and 12 farmers were found injured after the dust settled in Amba Giorgis. In Bahir Dar, farmers, whose land was given to foreign companies by the regime, set two horticultural farms and machineries on fire. There was an eerie of silence one minute and deafening gun shots in another in Bahir Dar on Wednesday where residents generally continued their stay-at-home protests. Debre Markos, a town that is completely besieged by regime forces, residents have begun a five day stay-at-home protest. Several towns and villages in the Amhara region have removed local administrations which were accountable to the regime and replaced them with interim administrations run by religious leaders and other respected members of the community. Weeks of uprising in the Amhara region continues as the Prime Minister, Hailemariam Desalegn said he had ordered regime forces to squash protests in the Amhara region in what many see as a war declared on the Amharas. The chief of staff, Samora Yunis is in Gondar holding meetings with local officials, it was learnt. Close observers of the crises say the regime military officials might have mulled over setting a military administration in the Amhara region. The journey over the last 15 years is a decade for tremendous achievements in the country. The nation has registered rapid economic growth that benefit citizens at all levels that won international recognition and is attributed to the active public participation. Mentioning some of the grand achievements, the Prime Minister said the nation has managed to extricate 20 million people from the abject poverty over the last 15 years. The country has also moved forward in attaining MDGs. It has shown a stride move in expanding health and education access nationwide indicating that 30 million citizens are enrolling in educational facilities. In the realms of job creation, the government has created millions of jobs for citizens every year. This has mainly focused to benefit the youth as a result many youth have been transforming into investors thereby contributing to the national development. However, the Premier said the rapid economic growth has instigated the public to demand for more development with urgency. This and the ever growing of the population that challenges the pace of the government have resulted public anger which is a legitimate concern. But, the ugly part, this legitimate public demand has turned out to be a violence and chaos letting the anti-peace elements who are waiting for such hotbed time for their destructive agenda. According to Hailemariam, his government has reviewed the very causes of the unrest. There are basic, related current issues and other fuelling factors. Before detailing the reason, the Premier expressed his deep sorrow on his behave and the government giving his solace to the families of victims and the people of Ethiopia. One of the basic issues, though the country has registered rapid economic growth with active public participation and beneficial to citizens at all levels which won international recognition, the unmet pace of the government’s response and the ever increasing public demand has contributed its share for the unrest. The population has doubled itself over the last 15 years constituting 30 per cent of youth. As the government is in state of transition, there is a gap in addressing the evolving demand of the public. Besides, the tendency of the leadership to use public authority for personal gain at all levels has been singled out as the underlined factor for the recent unrest. The current factors that agitate the unrest were also the overdue question of identity and border issues. As to the Premier, the intervention of anti-peace elements that bent on destabilizing the country considered as a fuelling factor for the meaningless and destructive mob. Considering the concern of the youth, the Premier said the government is well aware of the 30 per cent population of the country. Commendable job has been done in creating jobs in the country. The incumbent has been able to create millions of jobs on yearly basis. More effort is still needed to address the 20 million people living under poverty line. Besides putting a clear direction in the second GTP, the government has already revised the youth package in a way to actively engage and benefit the youth in the development of the country. The Premier said the involvement of the youth in the recent violence is telling by itself. The government has come to realize that widening opportunities for jobs and working closely with the youth to address the pressing issues of the youth. The Premier reaffirmed that his government is well aware of the involvement of Ethiopia’s enemies in fuelling incitement. Those who go red eye for the improving scenario of the county use this unrest as a hotbed for their destructive agenda. These forces that refuse Ethiopia’s right to use its natural resources. They try to destabilize the country using the extremist diaspora and for their evil move to dismantle the constitutional order. These groups have misguided and manipulated citizens who are hopeless and desperate fellow citizens for their evil move. They finance their messengers tasked to disintegration of the nation. For the government, the violence is not unrestrained one rather it is manageable, the Premier said. Tigria Weyane is finshed and the time is in 11:59:59 …I am so happy to this time fall of this Tegaru Weyane junta. If weyane has a sense of responsibility one thing to do at this level was resign peacefully and form a transitional Government to calm down this wave of People whom seems not to stop the up-rising. The other factor again is the blindness of the big institutions across the world (specially the west) not to act somehow as we see them react in the last decades around. This shows their hypocrisy and let the protesters to believe only in themselves. This for sure need to make aware the whole Ethiopian population. Woyane have a blessing from Uncle Sam,unless they were told to pack up and leave,they will be around to do the unimaginable. I’m surprised no one has, as of yet, referred that crosseyed- moron and weyane-puppet, Hailemariam Desalegn, to the ICC. The fact is ICC don’t get involved whatever you do ,as long as US is behind you running the show. TP’s on borrowed time lent by the devil himself. Fire breaks out at Qilinto maximum security prison (Ethiopia’s Auschwitz). Intensive gunfire ensued following the fire accident, creating a tense situation among local residents in the area. Qilinto hosts the country’s high profile political prisoners. TPLF thugs and its kotetam followers are quick to blame the fire on Ginbot 7 fighters. As one keen observer put it, how is that possible for the TPLF to know the arsons before a fire breaks out or the plotters before the bomb went off? Of course, …. An African man expressing his solidarity with the people of Oromo. He called the army to stop the PM even if it means assassinating him …. This is not in SYRIA. TPLF thugs killing protesters using Helicopter gunship. OMG. ወያኔ ኢህዲግ በሰሜን ጎንደርና በጎጃም ወገኖቻችን ላይ በአየር እና በምድር በከባድ መሳሪያና በጦር ሂሊኮፕተር በመታጀብ ህፃን፣ሴት እናት፣ወጣትና አዛውንትን ሳይለይ በጅምላ እየገደለና አካለስንኩል እያደረግ ነው !!!!! At least in Ethiopia people speak and protest. They have a constitution, they have private press. Moreover, the woyanes conduct annual parliamentary and party congress. In Eritrea ppl are in a much worse situation. They are completely muzzled by the military junta. No party congress since 1994, no parliamentary meeting since 2002!!! Eritrea is the only country in Africa without constitution and the bottom last country on the planet for freedom of press. Hundreds of our people are perishing in the ocean trying to escape tyranny. Yet, ppl over here make loud noises about Ethiopia’s internal issues but they never talk about the sad situation in Eritrea. It is like the junta is using remote control to mute them.What a shame! !